Congress appropriated $25,000 in 1886 for a lighthouse to mark dangerous Crabtree Ledge, a mile off Hancock Point in Frenchman Bay. The ledge is named for Agreen Crabtree, a local mariner and fisherman who was captain of a privateering vessel during the American Revolution. An additional $13,000 was appropriated for the lighthouse in 1888 and work began in 1889. The lighthouse helped guide many vessels carrying lumber and granite into the Taunton River, as well as passenger steamers heading to and from the railroad terminus at Hancock Point. The contractor that built the lighthouse was Sooey, Smith and Co. of New York City. According to the Historical Society of the Town of Hancock, many local laborers were employed for the project. The lighthouse's foundation, a circular iron caisson, was filled with concrete. The cast-iron tower was 37 feet high from its base to the focal plane. It was originally painted brown but was changed to white in 1903. Crabtree Ledge Light was first lighted on January 15, 1890. 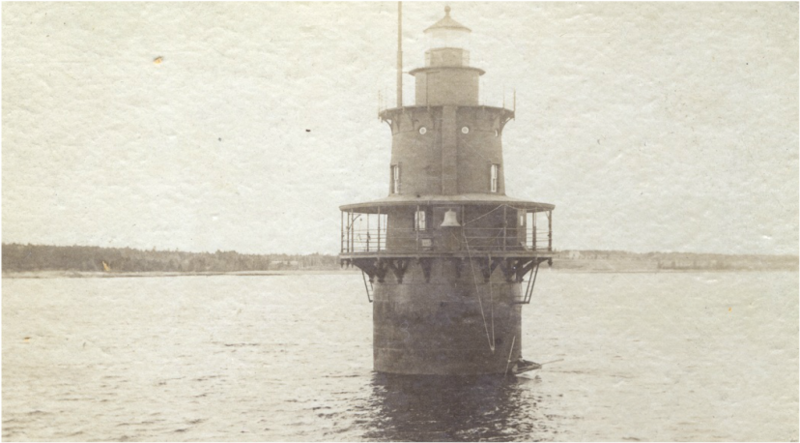 It was a typical "sparkplug" style cast-iron lighthouse of the period and had a fifth-order Fresnel lens exhibiting a fixed white light varied by a flash every two minutes. A 1,200-pound bell and striking machinery were installed on the pier in 1891. The first keeper was Charles Chester, a native of Philadelphia who had been a cabin boy at age 11 and the captain of his own ship at 19. He and his wife, Mary (Blake), eventually had 11 children, the last five of whom were born in a house at Hancock Point. Chester remained in charge at Crabtree Ledge until 1908. As the lighthouse was a cylinder, all the rooms were round. The kitchen and living room were on the second level. The third level was the bedroom. Above that was the lantern deck. The lowest deck was the basement, where rainwater from the roof was caught in a cistern and provided the water supply. Coal was also stored there. Most of Grandpa’s nights were spent in the lighthouse, although the house on the mainland was located so the bedroom window faced the light so he could see that all was well. If the light went out, as it sometimes did, Grandpa would dress quickly, rush down to the little boat and row out to the light. If there was a smokeout, everything would be all covered with soot and it would take all day to clean it up. Left: : Keeper Charles Franklin Chester and his wife, Mary Ellen Chester, courtesy of Charles Libby. Chester was keeper at Crabtree Ledge 1890-1908. Chester Brinkworth of Hancock Point served as an assistant keeper beginning in 1914. In the fall of 1916, Chester’s younger brother, Leon, filled in as a temporary assistant while the principal keeper, Jerome Peaseley, was on shore recovering from pneumonia. In late September, 18-year-old Leon Brinkworth returned from a trip to shore. According to some accounts, as he climbed the ladder on the side of the lighthouse with provisions in his arms, he slipped and plunged into the water. Other accounts report that the younger brother’s boat capsized. In either case, Chester, 35 years old, quickly dove into the water in a valiant but vain attempt to save his brother. Both of the Brinkworth brothers drowned in the lighthouse’s worst tragedy. A reporter for the Kennebec Journal wrote of the Brinkworths, “Both were bright, able, and highly esteemed young men and their tragic death has brought shock and grief to friends and associates.” Another assistant keeper, Joseph Whitmore, also drowned just six months later. The lighthouse was discontinued in 1933, the same year local ferry service ended. The lighthouse was subsequently bought by the father of Newbold Noyes, editor of the Washington Star, for a reported $115. Noyes gave the lighthouse to his three sons as a gift. The sons sold the lighthouse in 1937 to a friend, Fritz Allis, who summered at Hancock Point. He and some friends moved a reed organ into the lighthouse. When he married Tiense Gummere, the two spent their honeymoon at the lighthouse and ended up being marooned there for several days during stormy weather. He never returned after that, and the lighthouse fell into poor conditon until it finally collapsed into the bay in a winter storm in 1950. Some of the metal from the tower was salvaged for use in World War II, but it's said that much of the structure still lies in one piece. Charles Chester (1890-1908); Charles W. Thurston (assistant, 1902-1909); Joseph M. Gray (assistant, 1898-1900); Amaziah Small (? ); Edward Small (? ); Alton Triveau (? ); Jerome H. Peasely (c. 1916); Chester Brinkworth (assistant, 1914-1916); Leon Brinkworth (assistant, c. 1916); Captain Joseph Whitmore (assistant, ?-1917); Ora Jordan (?); ? Bulgar (? ), Vassar Lee Quimby (1926-? ).